Nothing in the whole of literature compares with The Master and Margarita. One spring afternoon, the Devil, trailing fire and chaos in his wake, weaves himself out of the shadows and into Moscow. 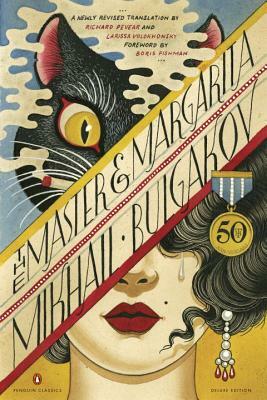 Mikhail Bulgakov’s fantastical, funny, and devastating satire of Soviet life combines two distinct yet interwoven parts, one set in contemporary Moscow, the other in ancient Jerusalem, each brimming with historical, imaginary, frightful, and wonderful characters. Written during the darkest days of Stalin’s reign, and finally published in 1966 and 1967, The Master and Margarita became a literary phenomenon, signaling artistic and spiritual freedom for Russians everywhere. This newly revised translation, by the award-winning team of Pevear and Volokhonsky, is made from the complete and unabridged Russian text. Richard Pevear and Larissa Volokhonsky (translators) have translated works by Tolstoy, Dostoyevsky, Chekhov, Gogol, and Pasternak. They were twice awarded the PEN/Book-of-the-Month Club Translation Prize, for their translations of Dostoyevsky’s The Brothers Karamazov and Tolstoy’s Anna Karenina. Pevear, a native of Boston, and Volokhonsky, of St. Petersburg, are married and live in Paris. Boris Fishman (foreword) is the author of two novels, A Replacement Life, which was one of The New York Times’ 100 Notable Books of 2014 and won the VCU Cabell First Novelist Award and the American Library Association’s Sophie Brody Medal, and Don’t Let My Baby Do Rodeo. His journalism, essays, and criticism have appeared in The New Yorker, The New York Times Magazine, the London Review of Books, The Wall Street Journal, and other publications. Fishman has taught at Princeton University and New York University. Born in Minsk, Belarus, he moved to the United States at age nine and now lives in New York. Christopher Conn Askew (cover illustrator) is a painter and tattoo artist whose illustrations have appeared on the covers of books, albums, and magazines. He lives in Los Angeles.